For the union council in Pakistan, see Gagra, Pakistan. Gagra (Georgian: გაგრა; Abkhaz and Russian: Гагра) is a town in Abkhazia,[note 1] northwestern Georgia, sprawling for 5 km on the northeast coast of the Black Sea, at the foot of the Caucasus Mountains. Its subtropical climate made Gagra a popular health resort in Imperial Russian and Soviet times. It had a population of 26,636 in 1989, but this has fallen considerably due to the ethnic cleansing of Georgians in Abkhazia and other demographic shifts during and after the War in Abkhazia (1992–93). Gagra is the centre of the district of the same name. It is located in the western part of Region of Abkhazia, and river Psou serves as a border with Krasnodar Krai of Russia. According to the Georgian scholars, Gagra is derived from Gakra meaning walnut in the Svan language. According to the Soviet sports tourism master Bondaryev, the name of the city originates from the local Gagaa clan. According to Professor V. Kvarchija, Gagra (< *ga-kʼə-ra) means ‘the holder of the coast’ in Abkhaz (Gagra was mentioned as Kakara, Kakkari on old maps). The town was established as a Greek colony in the kingdom of Colchis, called Triglite, inhabited by Greeks and Colchians. Colchis came under the control of the kingdom of Pontus in the 1st century BC before being absorbed by the Roman Empire, which renamed the town as Nitica. Its geographical position led the Romans to fortify the town, which was repeatedly attacked by Goths and other invaders. After the fall of Rome, its successor, the Byzantine Empire, took control of the town and whole Colchis. It became a major trading settlement in which Genoan and Venetian merchants were prominent, trading in the town's main exports - wood, honey, wax and slaves. The name "Gagra" appeared for the first time on a map in 1308, on a map of the caucasus made by the Italian Pietro Visconti, which is now in the Library of Saint Mark in Venice. 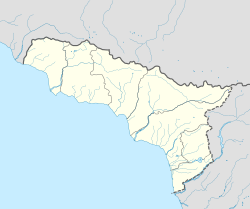 In the 16th century, Gagra and the rest of western Georgia was conquered by the Ottoman Empire. The western merchants were expelled and the town entered a prolonged period of decline, with much of the local population fleeing into the mountains. By the 18th century the town had been reduced to little more than a village surrounded by forests and disease-ridden swamps. Its fortunes were restored in the 19th century when the Russian Empire expanded into the region, annexing whole Georgia. The swamps were drained and the town was rebuilt around a new military hospital. Its population, however, was still small: in 1866, a census recorded that 336 men and 280 women, mostly local families or army officers and their dependents, lived in Gagra. The town suffered badly in the Russo-Turkish War, 1877-1878, when Turkish troops invaded, destroyed the town and expelled the local population. Russia won the war, however, and rebuilt Gagra again. After the war, the town was discovered by Duke Alexander Petrovich of Oldenburg, a member of the Russian royalty. He saw the potential of the region's subtropical climate and decided to build a high-class resort there. Having raised a large sum of money from the government, he built himself a palace there and constructed a number of other buildings in an eclectic variety of styles from around Europe. A park was laid out with tropical trees and even parrots and monkeys imported to give it an exotic feel. Despite the expensive work, the resort was not initially a success, although it did later attract a growing number of foreign tourists visiting on cruises of the Black Sea. In the Russian Revolution of 1905, a local uprising produced a revolutionary government in the town, which founded a short-lived Republic of Gagra. This was soon defeated and the revolutionaries arrested en masse. The First World War a few years later was a disaster for Gagra, destroying the tourist trade on which it depended. The Russian Revolution shortly afterwards saw the Bolsheviks take over the town; despite a brief French attempt to repel them during the Russian Civil War, the town was firmly incorporated into the new Soviet Union within Georgian SSR. The Bolshevik leader, Vladimir Lenin, issued a decree in 1919 establishing a "worker's resort" in Gagra, nationalising the resort that had been built by Oldenburg. It became a popular holiday resort for Soviet citizens and during World War II gained a new role as a site for the rehabilitation of wounded soldiers. After the war, various state-run sanatoriums were built there. The resort grew and was developed intensively as part of the "Soviet Riviera". In the late 1980s, tensions grew between the Georgian and Abkhazian communities in the region. All-out war erupted between 1992-1993 which ended in a defeat of the Georgian government's forces. Hundreds of thousands of ethnic Georgians were expelled from their homes in Abkhazia in an outbreak of mass ethnic cleansing in which thousands of Georgian civilians were massacred. Gagra and the Abkhazian capital Sukhumi were at the centre of the fighting and suffered heavy damage. ^ The Governor of Gagra District is at the same time Mayor of the Gagra municipality. ^ БОНДАРЕВ, Н.Д. (1981). В ГОРАХ АБХАЗИИ (In Abkhazian mountains) (in Russian). Moscow: Физкультура и спорт. ^ Murphy, Paul J. (2004), The Wolves of Islam: Russia and the Faces of Chechen Terror. Brassey's, ISBN 1-57488-830-7. ^ "Города Гагра и Владимир будут сотрудничать". Gagra District Administration. 14 May 2012. Archived from the original on 15 January 2013. Retrieved 28 May 2012. This page was last edited on 5 November 2018, at 12:57 (UTC).